You know it’s time to move. The financial reasons are right, the personal reasons are right, but what about the twenty years worth of stuff? They say you need to stage your home, get rid of some of this stuff for showings. Then actually moving – the new house may have less rooms, less storage – you’ll have to deal with it then. Whether you are thinking about moving in with a significant other, moving to a more urban lifestyle, empty-nesting or simply want to simplify your life in your current home, is the thought of going through all of you belongings completely paralyzing? The good news is that with a little guidance, you can tackle the task of downsizing without overwhelm. We’ve recognized this challenge, and offer pre-listing counseling to help our clients prepare for their move long before the sign goes up in the yard. While every situation is different, here are some of the things we help clients consider as they work to scale down their possessions and space so they can live a bigger life. Make sure to read to the end for an awesome giveaway! If you’re selling a lot of items, have an estate sale. An estate sale professional takes a small percent of the sales and does all of the pricing, heavy lifting, pricing and advertising. Many even have delivery services which will help your customers pull the trigger on that big item they can’t transport. Sell items online. A well crafted craigslist ad will attract lots of local buyers. And list items on local garage sale Facebook groups and your neighborhood Facebook and Nextdoor pages. Do I use it? My crock pot does not necessarily spark joy for me, but I use it several times every month. Do I need it? I might not have used it in a while, but I need to have a hammer and basic toolkit. Do I love it? I have a stuffed bull that sits on my shelf that my girlfriends gave me. It represents being strong like a bull in the face of adversity and I love it. Rethink your storage. If you’re not moving you may find after you’ve gone through everything that you are still lacking in storage. If you’re downsizing spaces, you’ll often find you’re losing storage space as well. Look for ottomans with storage and underbed storage solutions. Install shelving systems to better use the space you do have. Digitize and use the cloud. You can scan family photos, diplomas, awards. Use software to transfer CD’s, DVD’s, VHS to digital files that can be stored in the cloud or a local hard drive. Switch from books and magazines and use services like Kindle, Zinio or Magster to read. You can even photograph mementos and collections while getting rid of the real things. Hire some help. 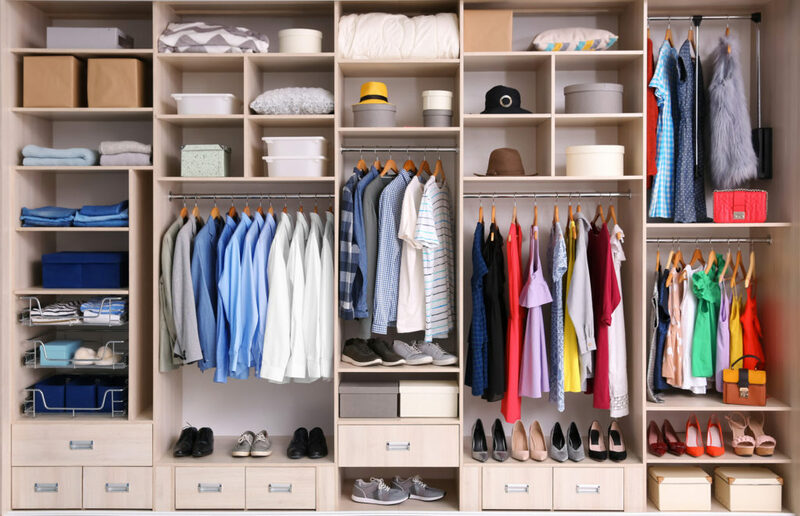 A good organizing professional can help you get through the emotional work of making decisions about things, plan your new space, install closet systems, donate or sell items for you and so much more. Most professionals charge an hourly fee to work with you as little or much as you need. You can get a plan and a kickstart for a very reasonable cost…..
…AND we’re here to help get you kickstarted! We’re giving away a session with our favorite organizer extraordinaire with A Simple Space. Whether you’re thinking about moving from the home you’ve lived in for 20 years and completely overwhelmed where to start, or you just want to make your desk space a little more functional – Sara Fisher will come and get you motivated and started – ON US! Just fill out the form and we’ll be drawing a winner at random. Good luck!